until a lemur jumps on your head! I believe that’s gonna be my new motto. The painting was a surprise by the Traveling Circus Ladies. Sam thinks he looks pretty cool and I have to agree. Beautiful job! the Ringtail Lemur and Kiwi the Kinkajou HoneyBear! Have you ever seen anything cuter?! Scottie even just “happened” to stop by to see his horses today. Chris had no idea this was going to happen today. The baby is eating a marshmallow – whole! Jan gets her turn in the aura of awesomeness that is known as the Kinkajou. Kiwi was the social butterfly but Liam stayed close to his momma. I think he’d heard about the frog-changing powers and didn’t want to risk it. Life is much cooler as a leaping Lemur! Yep, falling in love again. Gayle – gaze into my eyes, deeper, deeper, D-E-E-P-E-R!… I will turn YOU into a frog! (Got distracted by all the cuteness!) A good time was had by all. Gayle was very surprised. We snacked and drank and talked and laughed. We are all blessed to be part of each others lives. We visited with the rescue horse, JayBird. He’s doing well and I’ll update his story soon. 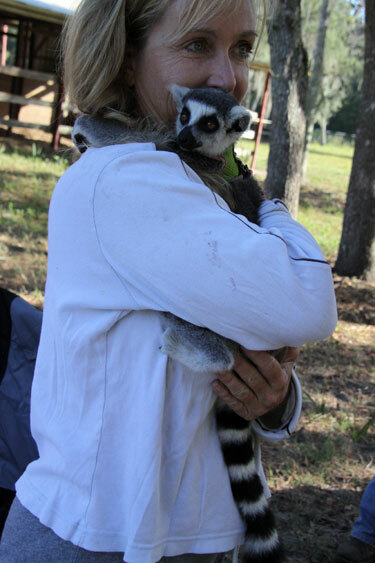 As you all go out for Halloween tonight – keep in mind the new motto – it’s not a party till a lemur jumps on your head! Gary worked more magic on JayBird today. He got to the shelter about 15 minutes before me and this is what I saw when I pulled up! He’s touching him! This little brown horse who’s been so terrified he hasn’t let anyone near, is allowing Gary to touch him. I’ll let the pictures speak for themselves. Miss Terri and her sister, Jan, came to meet JayBird and Gary. They’ll be his primary caretakers once he’s moved. This horse has no idea he’s about to walk right into Horse Heaven! He’s going to be such a cool guy. I feel simply giddy over the outpouring of love this boy’s getting. This little brown horse is a mystery. He was corralled by police and sent off to animal control to see if anyone would claim him. They haven’t. Hate to say but it’s not surprising. Authorities have tried to track down his brand but no luck. It’s not registered with our state. No one on any of the horse lists or any of our horse friends recognize it. I’ve been keeping tabs on the Lost & Found section of Craig’s List and Netposse. No one seems to be looking for him. So, my friends and I have put things in motion to give this boy a chance at the happy life he hasn’t had. He’s underweight and terribly frightened by people. In the weeks he’s been at the shelter no one has been able to touch him. It’s heartbreaking to see an animal who wants to trust but has been taught not to. I’m once again amazed at the outpouring of concern and help coming for this boy. He’s got a name now, thanks to Miss Terri, our barn owner. He’s going to be called JayBird and we will help him get his wings! Gary Adams of Quest Horsemanship (find him on Facebook) has stepped forward to work with JayBird. He met with us this past thursday and feels he’s definitely got potential. The poor guy is extremely reactive and anticipates that a person must mean bad things. Sure wish he could talk to us but I guess that’s what he’s doing in his own way. Gary spent over an hour working with JayBird and made great progress considering his circumstances. Gary is not speaking or giving any commands. He’s talking to JayBird with body language and getting him to move off pressure. This is Natural Horsemanship which is far removed from the old Cowboy way of overpowering to defeat the animal. In Natural Horsemanship it’s all about the relationship and trust not force. It seems crazy that a horse would think the same as a bunny, but they do. Anything and everything could eat them. We are predators and they are prey. A horse feels most comfortable in a large, open area with other horses where they have the ability to see everything around them. Keep in mind, JayBird is at a dog shelter with hundreds of barking dogs (predators) and lots of people (predators) constantly moving around him. Their instincts tell them fight or flight. Once he began settling down JayBird was taking refuge in his stall and Gary was able to stand in the doorway. After some time he was able to touch him with what’s called a “carrot stick”. Different trainers call it different things. It’s basically an extension of your arm and should not be used for hitting, it’s used to apply pressure to different parts of the horse to get them to move or stand still, depending on what you’re asking. It’s all part of desensitization so JayBird can begin to understand a person can mean good things. At any time, the horse could have struck or kicked Gary but he chose not to. JayBird has a stressful week ahead but Gary, Gayle, Terri, Jan, Therese and The Traveling Circus Ladies are going to help him through it as much as possible. The vet has to come out and geld him (neuter in the dog world), pull blood to send off for his Coggins test and give his vaccinations. All this must be done before he can be moved to his rehab facility at Miss Terri’s place. We want to make it as least traumatic as possible so Gary wants to be on-hand to assist the vet – we’re so thankful to have found him! Once JayBird is moved to Miss Terri’s place his real rehab can begin. There’s word a family may even be interested in adopting him once he’s ready! JayBird is seeing firsthand the power of people coming together to help a lost soul. Most find out their own souls are all the better for it. I’m very proud to be part of such a loving horse community. Mountains can certainly be moved even if it is one bucket at a time, or one little brown horse at a time. We were mean the day Tanner got his teeth floated. He was feeling no pain from the sedation so we set him up for these pics… hee! hee! Tanner’s daddy, Robb, installed lovely florescent lights in the barn for us – makes a HUGE difference at dinnertime since it’s already getting pitch black by 7:30pm. We all thank you, Robb!